Late to the Party | Musings on design and advertising from a Philadelphia area graphic designer. You spend your parents money (and eventually your own) on a great education. You pay your dues and spend years honing your craft. You work hard and do your best to be creative in tough or uncreative situations. You finally get ahead a bit, only to be spun right back into the doldrums of having to prove yourself to others (not to mention prove TO yourself) that you have what it takes. This has been life the past year for me. Economic hardships have hit a lot of companies and consequently, people lose their jobs. I’ve been included in that group, but luckily, I’m trained in a profession where it’s very easy to be your own boss if you have the skills and the drive to make it happen. It’s been quite a year since getting laid off from the only truly creative position I’ve held. I learned how to be a father, spent a great amount of time with my daughter, learned HTML and CSS, got myself a website and even landed some steady freelance work. The one thing I’ve always missed as I look back on my career is being part of a creative team. That’s why I’ve continued to send out resumes to agencies and businesses all over the Philadelphia area in hopes of landing with a great company with a talented group of people. Sure, freelancing is great, especially when I’m working on projects while sitting on my deck enjoying the sun or keeping my own hours, but I’m the kind of person who thrives on communication and interaction. I feel that communication breeds creativity, and when you are the lone source of creativity for too long, things can get stale. I don’t mean to sound like I’m complaining. Sure, it’s disheartening to get virtually no response to all those resumes, that’s only natural. But in fact, I feel I’m a better designer than I was a year ago. I’ve had the chance to do some fun small projects and work on getting my personal website and portfolio in order. I’m also much more confident in my web design abilities and my abilities to support myself if that dream job never materializes. I’m just looking for that spark. Have you found yours? 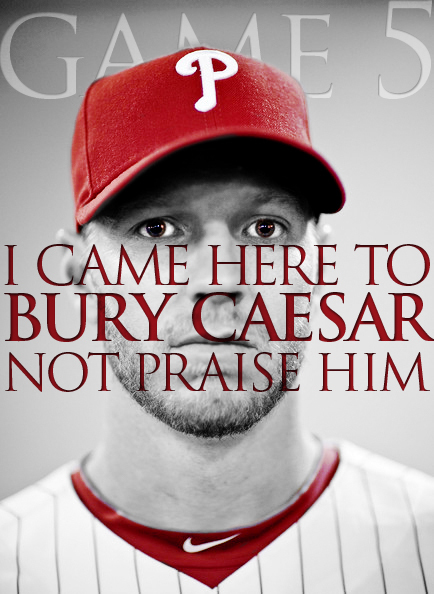 So the amazing performance by Roy Halladay last week motivated me to design some t-shirts. So I remembered I had started a spreadshirt.com profile and decided to have some fun and create a t-shirt to commemorate the event. 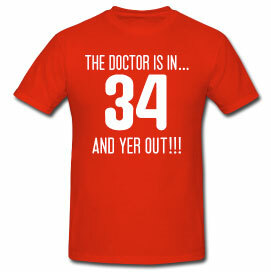 Well, 1 shirt turned into 31 shirts. I guess time flies when you’re having fun. No bites yet, but even if no one buys, (please buy) I’ll still have had my fun. Check it out! My father-in-law is quite the artist and was commissioned by my wife to design and bake the coolest cake I’ve ever had in my life. It certainly helped ease me into my 3rd decade and totally made my day. It pained me to cut into it, but don’t worry, it tasted as good as it looked. Thanks Dad! I also took the chance, recently, to enter the Philly Ad Kids logo contest. Jason over at PAK is doing a great job of getting the word out there about the best and brightest young creatives in the Philly area. Technically, I’m not a “kid” but I grew up in Philly, went to college in Philly and still call it my home, even though I’ve since moved to the burbs. Plus the deadline was on my birthday, so I felt obliged to enter. Here’s hoping a little birthday luck comes my way! Oh, and hellooooooo October!! My favorite month of the year, NO contest here. You know it’s time for fall when you start to see these wonderful orange and brown/black boxes start to pop up in your local supermarket. 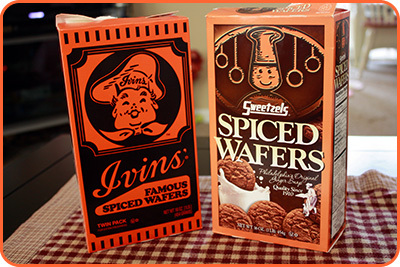 Growing up in Philly, my family always shopped at ACME which has the market cornered on Ivins “Famous” Spiced Wafers. I remember being fed these sweet and crunchy confections every fall along with a cup of milk or glass of apple juice, and always feeling excited when I saw the boxes lining the shelves because I knew my birthday was coming, and Halloween wasn’t far behind. Since I’ve moved to the suburbs, however, my shopping preference has changed to GIANT, and they only carry Sweetzels brand of spiced wafers. Of course I’m not picky so I purchased them and was delighted to find the familiar crunch and spice I remember from years past. But I was curious… which wafer would win in an ultimate spiced wafer throwdown? After picking up a box of Ivin’s on a quick stop at the ACME, my wife and I sat down to sample the spoils. At first glance, the boxes look similar, each donning the smiling baker. Ivin’s design goes for simplicity with the strict Halloween black and orange with stencil artwork and a rather German and portly-looking chef (the cookies are, afterall, a PA dutch specialty). The Sweetzels box goes with the more clip-art style illustration chef, but also gives a product shot next to a hand drawn chef and his dog. The proverbial gauntlet, however, is thrown down by Sweetzels with the tag line “Philadelphia’s Original Ginger Snap. Quality Since 1910.” I don’t know about you, but if you’re from Philly, you know that ACME supermarkets pretty much own the city. I never even heard of GIANT or Sweetzels until I moved out of the city. So by my standards, Ivin’s was king of the Spiced Wafer. I had thought about comparing the two brands for a while now and am always interested that you never see any advertising for these cookies, but I guess when everyone knows they only come out from late August to late November and you’re vision is basically assaulted with orange when you walk in your preferred supermarket, there’s no real reason to use traditional advertising. But back to the match at hand, after transporting the cookies to a safe location (my kitchen), I inspected the ingredients for any hint of superiority. The verdict, virtually identical. I then looked to the location of the producers. Sweetzels (these days at least) is not technically from “Philadelphia”, but are produced in Skippack, a suburb about an hour outside the city. Ivin’s, however, is not even from PA. These cookies are flown in from Eden Prarie, MN….MINNESOTA?!? Oh well, I guess that is the way of the world, but my childhood image of Ivin’s is now slowly eroding. Hoping for the best, and expecting at least some difference or reason to place Ivin’s back on the pedestal, I open the boxes…even the packaging is identical. Now for the fun part…the eating. Sweetzels takes the first swing: sweet, crunchy, with the spicy aftertaste I’ve always loved. (This is a great contest, BTW) Ivin’s counterpunches: sweet, crunchy, with the spicy aftertaste I’ve always loved. Final verdict? It’s a boring TIE! The bottom line is, you can’t go wrong with either cookie. They both stack up to my autumn memories and if you’re not careful, both can break a tooth with any bite. But if you’re not into the crunch, toss them into the microwave for 30 seconds and enjoy. They go great with milk, cider, apple juice, vanilla ice cream or an Octoberfest beer! I even make my pumpkin pie crusts with them. I’ve decided to try my hand at making my own spiced wafers this year, so I’ll report back with the results. 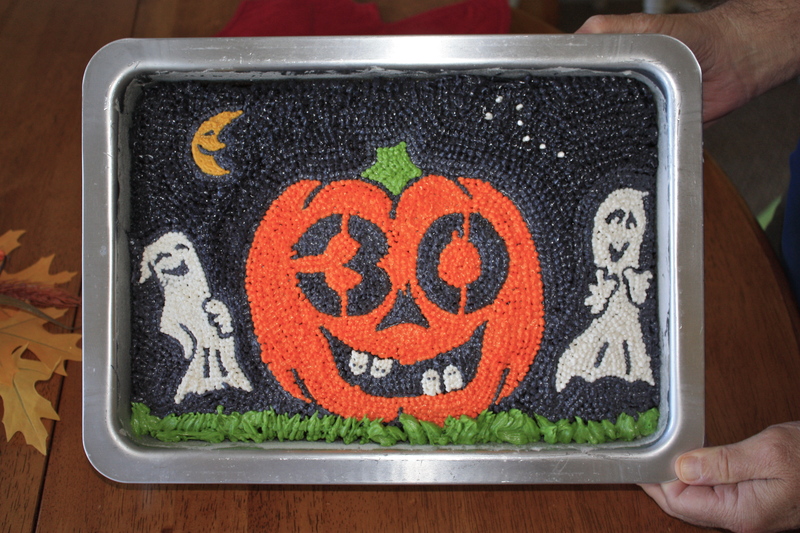 But one thing is for certain, they will be a staple in my kitchen every year. And if you know me, you know I can’t WAIT for Halloween and the cool, crisp, autumn air. I got married in October, took my honeymoon in New England, collect vintage Halloween postcards and throw an Annual costume party for my friends. Needless to say, I’m a Halloween junkie. 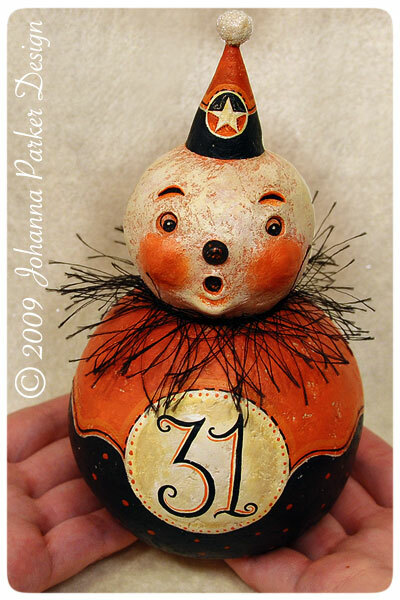 That’s why I thought I’d send a little love to one of my favorite Halloween artists, Johanna Parker. Miss Parker creates vintage style Halloween figurines out of paper maché from her home studio in Colorado and boy is she talented. Her artwork blends right in with the vibrant and whimsical Halloween art of the 30’s, 40’s and 50’s such as that from the Beistle Company. How creepy is that first “fan” cheering on Juan Samuel? It made me cringe and wonder, how did someone approve this for placement on TV? I always love going back and finding commercials and TV shows from my youth. Problem is, whenever I do, I’m sorry I did. Everything seems so staged and hokey. The production value was horrible, the acting was poor (although they are athletes) and the writing seemed to be trying too hard. Yes I’m picking on this particular series of ads because I remember seeing them when i was little, and now that I’m in tune with the industry, I have much more of an appreciation (or disbelief) for how bad they were. It didn’t help that the product at the time wasn’t that great, since the Phils were just easing into an era of forgettable bastball. But overall, I find that if you go back 25 years and look at the production value of commercials in the 80’s, you wonder how anyone’s opinion was ever shaped by those ads. Do you remember the “Ads of the 80’s?” if so, I’d love to hear about some of your favorites or least favorites. What about ads you thought were great as a kid, but seeing them now makes you smack your forehead? Or what about those ads that really were great back then and have inspired the ads of today? If you can find them online, I’d love to see them.